For many organizations like like Movimiento Cosecha, social media sites like Facebook are where your supporters are already active. Image: Movimiento Cosecha. In the last few months, the two of us —Patricia and Randall—have had experiences that changed what we thought was possible as digital organizers. We discovered a communications channel that combines the scalability of email and text marketing with the effectiveness of one-to-one conversations. It doesn’t hurt that we see response rates in this channel that are 800% higher than email asks. That channel is Facebook Messenger. Over one billion people around the world use Facebook’s messaging platform—Messenger—every month to connect with friends, family, and businesses. Advocacy organizations are using automated Facebook Messenger conversations powered by bots to raise money, educate the public, contact their elected representatives, and turn people out to vote. These Messenger programs have no interaction between humans—it’s all between the user and a pre-programmed bot. We saw those automated Messenger programs and wondered—could we combine the higher response rates and scalability of a bot to recruit people and ask them to participate in small advocacy asks with the effectiveness of one-to-one interactions to move people to get deeply involved with an organizing campaign? Here are four ways we’ve experimented with Messenger, along with our early results. Movimiento Cosecha organizes to win permanent protection, respect, and dignity for the undocumented community in the United States. The primary audience for their Messenger program is Spanish-speaking parents and workers. 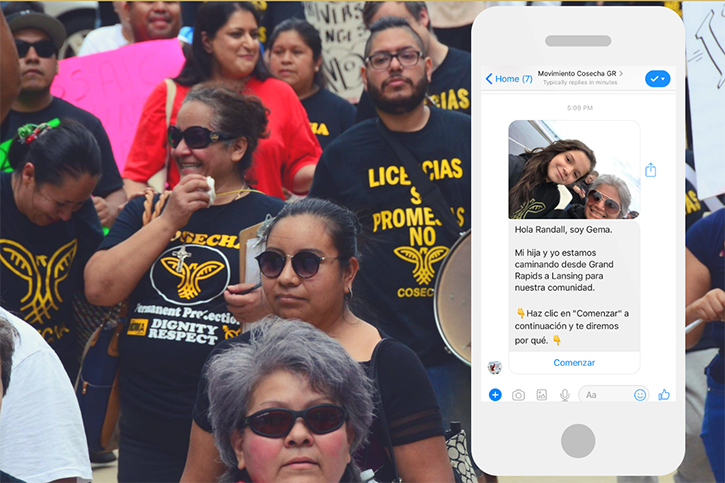 Cosecha uses Facebook Live broadcasts from office or home settings to inform their supporters about campaign updates and recruit new supporters and broadcasts of rallies and marches to recruit new supporters. They ask viewers of the broadcasts to comment a keyword on the broadcast to get connected to the movement. When someone comments a keyword, they receive a message in Messenger. When a supporter replies to that message, they are opted-in to Messenger conversations. The process is easy for the supporter. They don’t need to wait for a web page to load or type in their contact information on a petition. In the five months since Cosecha launched a pilot Messenger program in New Jersey, they have recruited 900 subscribers from a page with 4,600 followers—primarily via Facebook Live broadcasts. Cosecha uses public pressure to create political change and organizes immigrants to tell elected representatives the issues that are important to them. When driving calls to representatives, we knew that many of the Spanish-speaking parents and grandparents we are organizing had never made these types of calls before and may be hesitant because of language barriers and unfamiliarity with the tactic. We used Facebook Live broadcasts to explain the effectiveness of calling elected representatives and encouraged people to call even if they were nervous. We then asked supporters to comment a keyword on the livestream to open a conversation in Messenger. The supporters would then receive a daily messages asking them to call a different elected representative throughout the week. The message included a call button that acts like a speed dial, when the supporter presses it, it calls our legislative hotline. We saw a nearly 99% open rate for these broadcasts. We used Twillio—a cloud communications platform—as a legislative hotline to patch callers to our selected representative. When someone made a call, they heard a pre-recorded Spanish-language message that guided them on how to effectively convey their message. In just 10 days, we were able to drive over 500+ calls to decision makers in New Jersey from Spanish-speaking immigrants. We also captured their phone numbers, which enables us to communicate with them via phone and peer-to-peer text. Nearly 25% of those callers answered follow-up messages asking for their city and we can now send them information about local events. Sunrise Movement is a movement to stop climate change and create millions of good jobs in the process. The primary audience for their Messenger program is high school and college age youth. Sunrise Movement used Manychat, a Messenger marketing platform, and LocationKits, a tool that takes user location data and returns locations near them, to help supporters find a rally at their Senator’s office. Organizers also answered questions from supporters and pointed people to resources if they wanted to organize their own rally. Four percent of the message recipients RSVPed to attend a rally near them, a 300% increase over same ask made by email. Due to the overwhelming success, Sunrise is now expanding its use of the tactic to connect subscribers to one of hundreds of town halls nationwide, or encourage subscribers to organize their own town halls discussing the Green New Deal. Cosecha invited people to attend a march and rally via peer-to-peer text messaging and Messenger. The RSVP rate for peer-to-peer texting was 4% and 10% for Messenger, a 150% increase over peer-to-peer texting. People primarily use Messenger as a channel for conversations with friends and family and aren’t accustomed to receiving broadcast messages. That leads them to reply to messages with questions about getting involved, sharing their personal stories of why the issue matters to them, and other replies. For organizations running a bot only program, these replies are a problem because if people don’t click the buttons or respond with the keywords that were set by the bot builder, the organization is unable to deliver the series of messages they created. We love these replies because they are openings for organizers to engage in a conversation and move people to participate more deeply in the campaign. For example, Cosecha uses these conversations to recruit people to attend an organizing meeting or other events in their community. There are several bot platforms that are easy to use and inexpensive. The examples above use Manychat. A full review of the platforms is beyond the scope of this post, but here’s a couple of platforms that advocacy organizations are using. Creating a basic chatbot on your own on the ManyChat or Chatfuel platform takes 10 to 30 hours. You could also hire a bot expert or agency to build a bot for $500 to $2,500 (or more). You can expect to spend 5 to 20 hours a month managing a basic Messenger program. 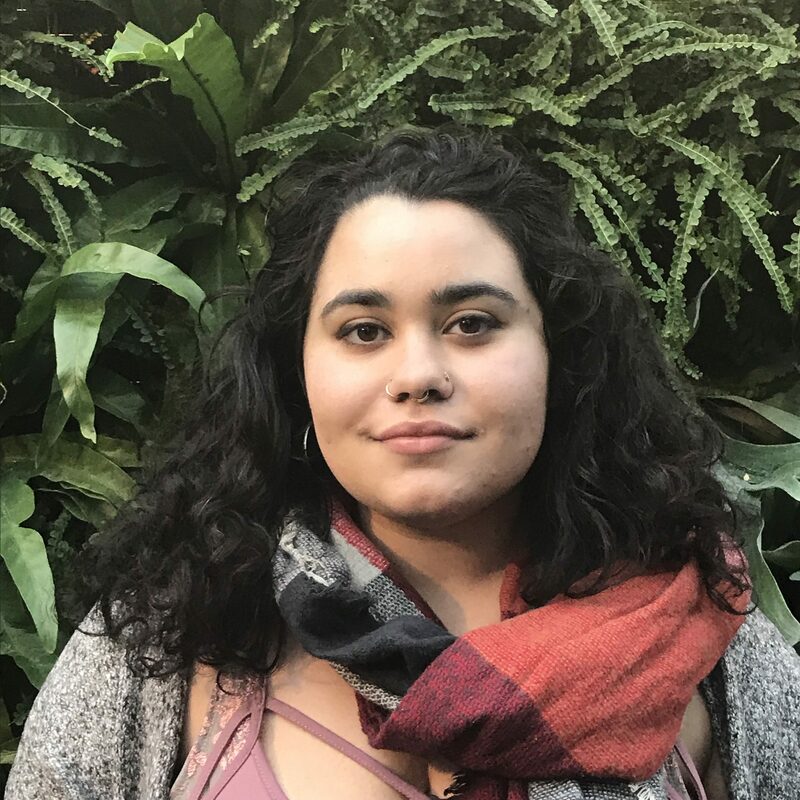 Cosecha and Sunrise Movement spend much more time on their Messenger program each month because organizers are connecting 1:1 with people in Messenger and recruiting them to participate in campaigns. The biggest risk is that Facebook changes how organizations can use Messenger. Those two announcements might seem to be in conflict, but the privacy-focused communications platform might be a pivot to messaging (and generating revenue from messaging) and away from a platform that is focused on a News Feed. We don’t know what Facebook will do in the future, so it’s important to consider the risks. Facebook could change the types of messages we can deliver, change inbox placement, eliminate the use of push notifications or eliminate the ability to use Messenger for marketing altogether. Sunrise is proactively collecting email addresses and phone numbers of Messenger subscribers with petition asks in Messenger to hedge against these risks and to reach their supporters across channels. Running a Messenger program that combines a bot and one-to-one conversations is a lot of work. Aside from the Messenger bot set-up, your organization may have dozens or hundreds of new messages coming in each week from people who want to be involved in your work. If you have a people-powered theory of change, it’s a great problem to have. Those replies can be handled by volunteers or staff and are the beginning of a conversation that moves the supporter up the ladder of engagement. We’ve discovered that Messenger is an effective channel to supplement peer-to-peer text messaging, phone calls, email, social media and the web. 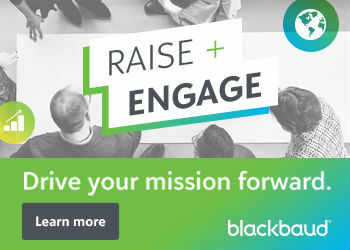 Supporters can complete a variety of tasks from within one app — or move from the initial introduction (livestream of action) to completing the task (calling the rep) with minimal friction. Like any new platform, it comes with risks and requires a strategic assessment, but the ability to combine the breadth and scalability of broadcast messages with the depth of 1:1 conversations makes it the most effective communications channel we have right now. Randall Smith is the founder of PowerLabs. He specializes in helping clients design and run people-powered campaigns. Clients he has worked with include Courage Campaign, Free Press, IfNotNow, Kentuckians for the Commonwealth, Movimiento Cosecha, and Sunrise Movement. Previously, Randall co-led a team that provided strategic support to user-generated campaigns on Change.org's platform. His work at Change.org helped people win life-changing (and life-saving) victories including freeing loved ones from prison and changing the policies that govern lung transplants for kids. His team at Change.org garnered the company millions of dollars of earned media, and added millions of users to the platform. Learn more about his work and get connected at https://randallsmith.io.